There comes a time in every dude's life when he feels the need to prove his manliness, like that time you nutted up and squished that icky-icky big nasty spider. Oh God, gross, part of it almost touched my hand!! 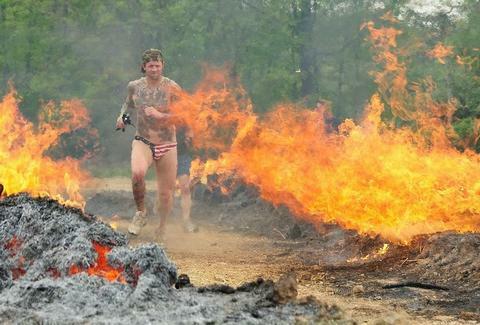 Giving you more man than most can handle, Tough Mudder. Because why not, Mudder's a seven-mile course through Bear Valley that sits 8,000 feet above sea level and includes 19 chest-hair-required obstacles, a 1,500-foot cajones-shrinking ascent through the Sierras, and a mile where you're basically carrying a log up a ski slope -- all awesomely conceived by a former British Special Forces dude who graduated from Harvard Business School and hails from, no joke, the Sherwood Forest, where he grew up having to use the little John. The second-ever TM will be twice as big as the inaugural event in Bear Creek, PA (thanks to double the days of mudding) and twice as hard, according to Robin Hood the Brit who doesn't "want to say it's tougher than the other, but me personally, I'd struggle more" -- though to be fair, that's mostly because the Sheriff of Nottingham's men aren't there to rob. Obstacles will include The Gauntlet, where you'll get hosed down by pressure soakers as you navigate the Bear Valley half pipe; The School of Tough Knocks, which'll include a climb up-and-over a yellow school bus; and Berlin Walls, where you'll need to work with other Tough Mudders to conquer a 12-foot fence -- preferably by standing back and presidentially ordering everyone else to "tear down that wall!". The event'll also include a snazzy post-race party, where they'll have live music, BBQ, a freebie first pint, and gratis Mudder tattoos, which you'd totally man-up and get if they were applied with a sponge instead of that icky-icky needle.